I’m not sure if I’ve ever mentioned my love for the original Games Workshop plastic Skeletons from 1991 before. I bought the Skeleton Army box (that included cavalry and a chariot) sometime around 1993 and it formed the basis (with Kev Adams metal Zombies and various other metal Wraith/Vampire/Necromancer miniatures) for my Undead Army of that period. Yes there were only 4 bodies and 2 skull choices which limited options somewhat but it was a triumph for fantasy plastic which up to that point had struggled to be taken seriously. Previous attempts that included Fighting Fantasy 60mm, Drastik Plastik Orcs, Pychostyrene Dwarves and the Warhammer Regiment box designed for padding out WFB 3th Ed units had all been failures but the Skeletons marked a turning point in what could be possible. 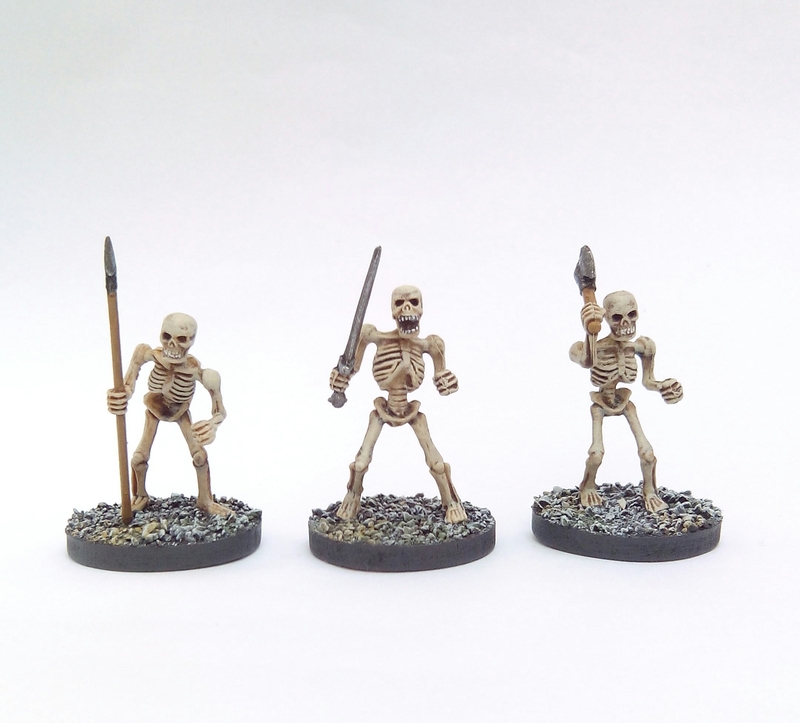 Here’s 3 of the original 1991 Skeletons quickly rustled up as extras for my D&D game. 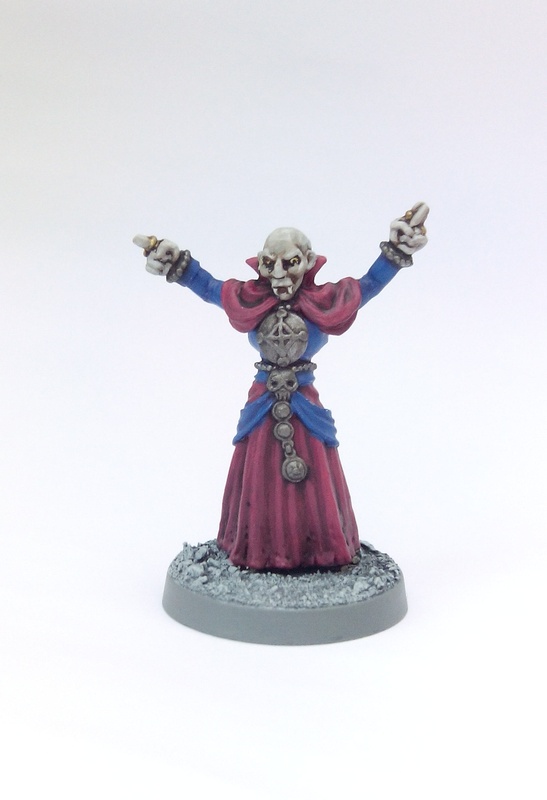 A Cleric PC has gained ‘Animate Dead’ spell and so insists on raising corpses as disposable ‘trap checkers’. I decided not to bother adding shields and just left them ‘as is’. This entry was posted in Post-1990 and tagged Citadel, Games Workshop, Skeleton, Warhammer on August 6, 2017 by Hobgoblin Orange. Another old figure here, a C35 Knights of Chaos from 1984. 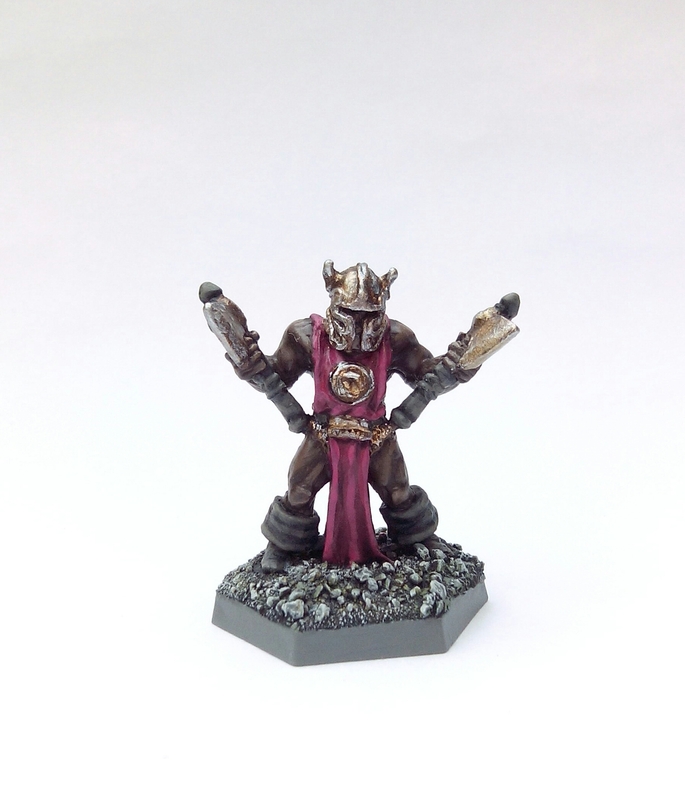 I’ve painted one of his contemporaries (Elric) from this era of Chaos Warriors before. This time I decided on trying a dark skin tone for a change and it worked okay, so it’s something I will definitely be exploring further. This entry was posted in Pre-1985 and tagged C35 Knights of Chaos, Citadel, Games Workshop on May 21, 2017 by Hobgoblin Orange. 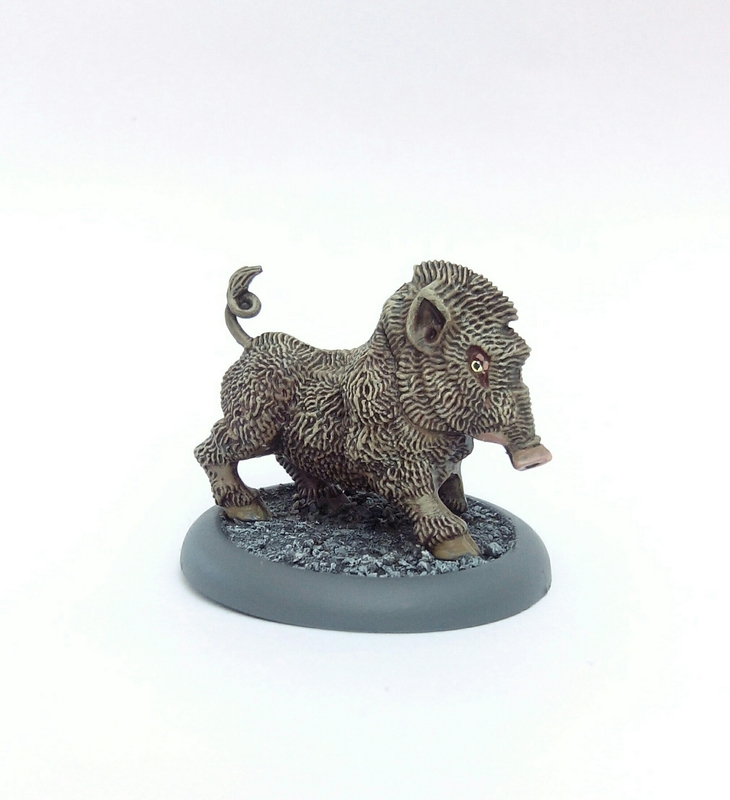 ​It’s suprisingly difficult to pick up a single boar miniature suitable for Frostgrave. The limited wild boar miniatures out there seem to be made either as scenery/tokens for games like SAGA (too tiny) or pork monsters resplendent in armour and saddles (massive) to be used as mounts. A cheap compromise was found for my Frostgrave. This is an old (1993) Games Workshop plastic boar from a junk eBay lot meant to be ridden by an orc. Not surprisingly that means it’s a horse sized beast in comparison to other animals in 28mm. It’s Hogzilla. It’s also missing it’s tusks. Meh, it’ll do. Next! I’ve also painted up some more treasure tokens. 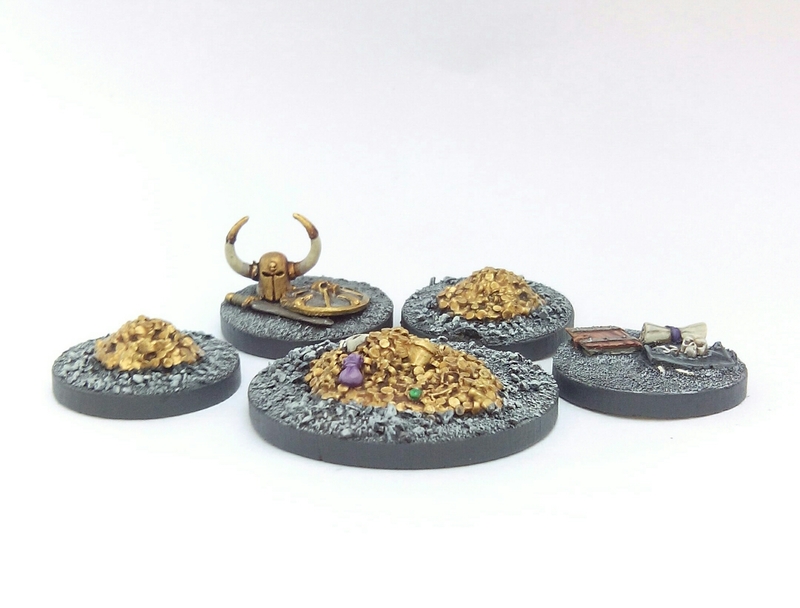 Three money piles made by Dark Art Studio – cheap and cheerful and nothing to write home about, plus a couple of kitbashed tokens using various leftover sprue bits and an old Citadel brazier that I got in another job lot eBay auction. This entry was posted in Post-1990, Pre-1985 and tagged Boar, Dark Art Studio, Frostgrave, Games Workshop on February 19, 2017 by Hobgoblin Orange. I’ve mentioned before my predilection for the official AD&D miniatures produced under licence by Citadel in 1985. Of course that wasn’t the only line of licenced miniatures they were producing at this time. Another particularly splendid range (assuming you ignore the gargantuan 30mm Boromir mounted on a tiny 25mm scale horse) was the official Lord Of The Rings miniatures range. This small set of figures was only part of Citadel’s range for a couple of years before the Lord of the Rings licence from Tolkien Enterprises moved on to Mithril Miniatures – presumably because Games Workshop wanted to concentrate their efforts on the more profitable Warhammer game line. Like all the figures designed at this point in time by Citadel they clearly show the transition in technical improvements in comparison to a lot of the ‘lumpy’ and poorly sculpted pre-slotta models in production from only the year before. 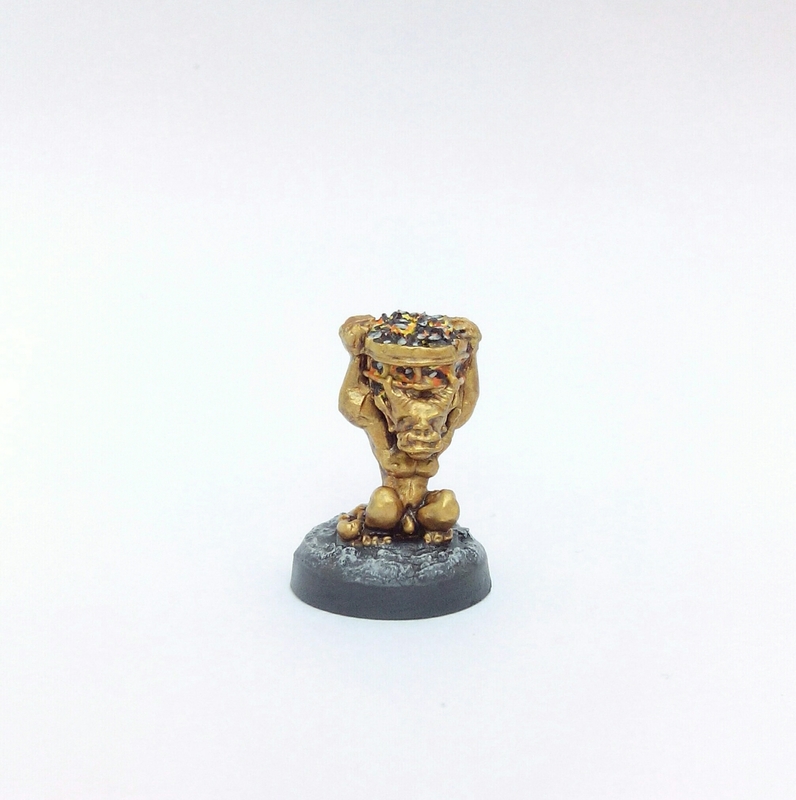 This particular goblin miniature (like other mounted figures across Citadel’s ranges then) was blister packed with another figure to represent the same miniature on foot. I never bought this blister but did manage to own the mounted goblin and wolf through a trade with a friend in 1986. 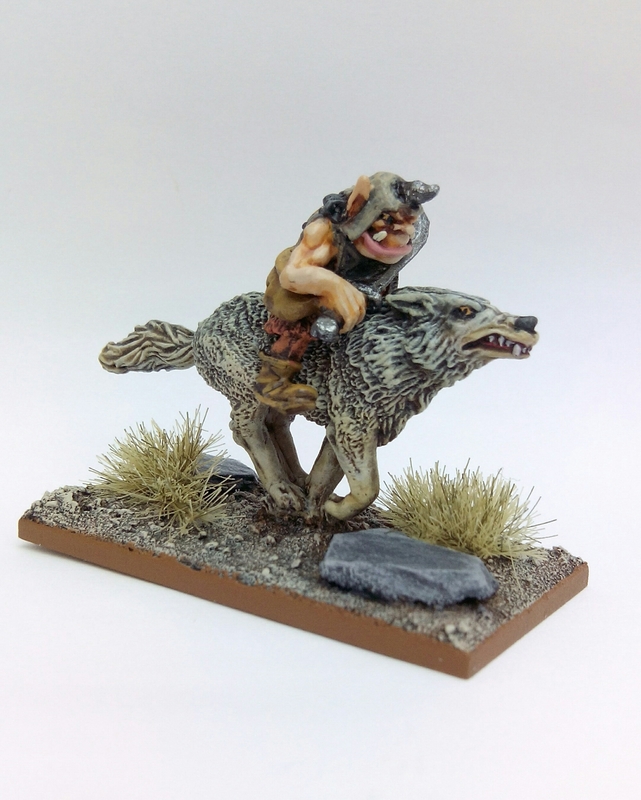 I had plans for it to join my large Goblinoid Army in the ranks of the wolf riders however when the time came to paint and assemble these in the late 80s this model had disappeared – presumably a casualty of poor storage as I certainly don’t remember trading it. Recently wanting to own this figure again had me searching for several months to try and buy a bargain on eBay as a replacement. This met with no success so in the end I bit the bullet and bought this one for about £7. 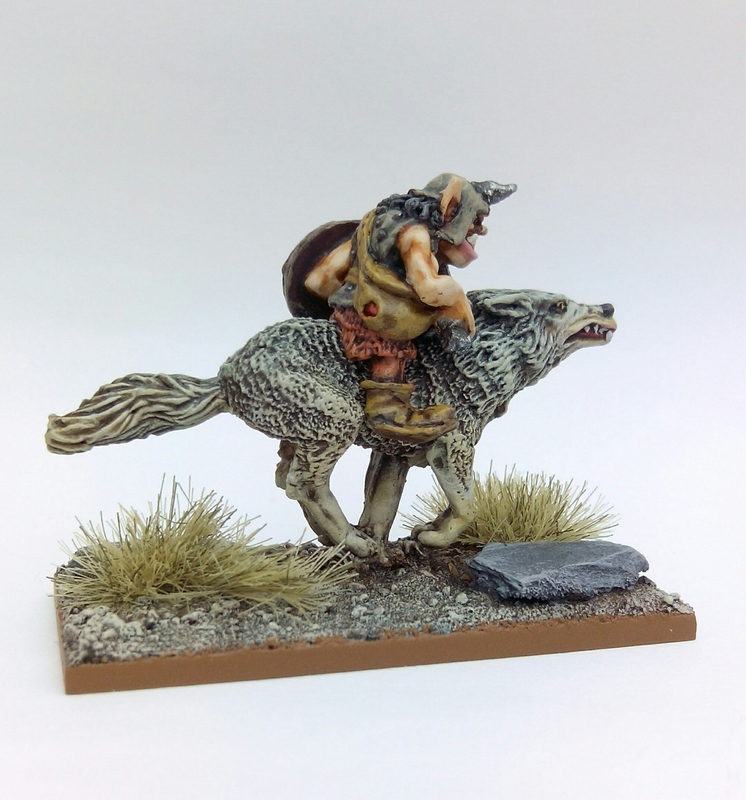 Back in the late 80s when I originally painted my wolf riders wolves were painted without any thought to how wolf fur actually looked. They were all the victims of a monotone coat of bluey grey like ‘Elf Grey’ or black with lighter grey highlights. This wasn’t just me trying to speed dry brush my way through regiments – it was the accepted norm that even GW studio painters used. There had also been a universal agreement by this point that Goblins had green skins and red eyes. So with no desire to paint this as a green skin goblin on a plain grey wolf here’s my version with a nod towards more variation found in wolf fur colouration and a different take on goblin skin tone. 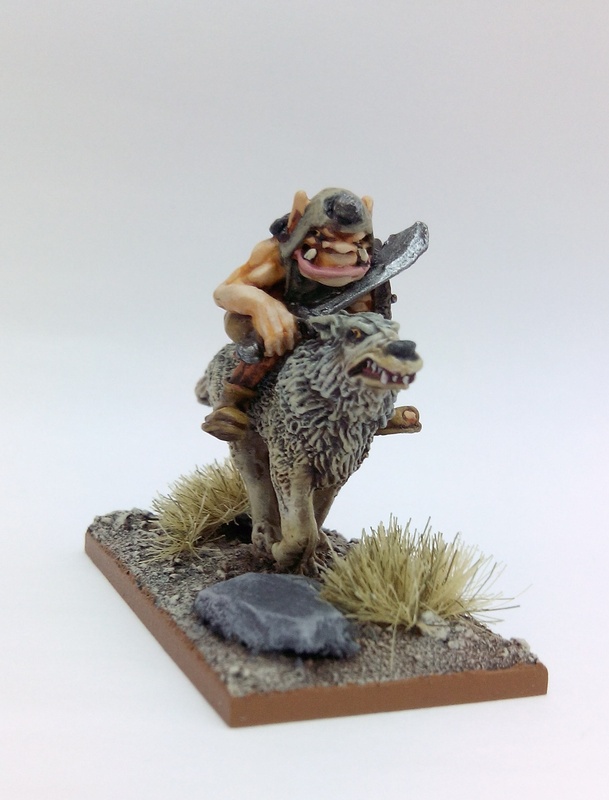 This entry was posted in 1985-1990 and tagged Citadel, Games Workshop, Goblin Warg Rider, LotR on June 26, 2016 by Hobgoblin Orange. Recently I bemoaned the lack of decent spider sculpts throughout the years I’ve been in and out of the hobby. It seems spiders aren’t the only creatures with a dearth of suitable miniature representation. 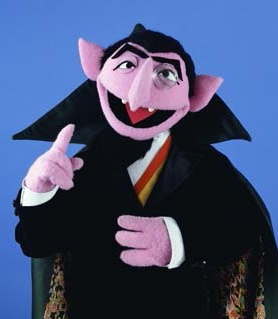 The vampire has a rough ride too. For me this cliche doesn’t work with fantasy settings – hiding early 20th century formal evening wear under a cloak looks odd. Reaper Miniatures do about the best vampire suitable for use with fantasy but low and behold as soon as I came to buy one there were none available on eBay. Typical! So in the end I settled on an old GW figure from the early 90s that I managed to pick up for about £3. It’s actually a sculpt I used to own back in 1993 that made his way into my undead army. It appears to still be fairly popular as a miniature now and despite what the Buy It Now prices on eBay would have you believe it’s not rare. I’ve seen it used regularly in people’s battle reports for undead armies – it appears to be getting just as much use now in KOW as it ever did in WFB. This entry was posted in Post-1990 and tagged Frostgrave, Games Workshop, Vampire on December 13, 2015 by Hobgoblin Orange. I managed to pick up the following four figures off eBay at a reasonable price a few weeks back, obviously with my ongoing Frostgrave project in mind. They’re all Citadel metal slotta based miniatures mostly meant for Warhammer. They span an interesting few of years of production. We start at 1985 and the 2nd Ed of WFB, through 1986 and the 1st Ed of WFRP and then beyond that into 1987 and the 3th Ed of WFB – aka ‘Oldhammer’. First up is one of the ADD 6 Paladins from the TSR licenced AD&D miniatures range from 1985. These Player Character packs were obviously meant for AD&D rather than Warhammer and sold in blisters of 3, representing the same character from low to high level as they developed in the game. I’m quite nostalgic (unusual for me) about this whole Citadel AD&D range however I disliked these Paladin figures at the time and I have to admit I wasn’t looking forward to painting one now. I’m not totally happy with the finished paint job but it’s useable so I’m glad I completed it. I’d never really paid much attention to the miniature when it came out and remember the Sibbick illustration more. After looking properly at it now it had escaped me just how ‘Jes Goodwin’ the sculpt actually is. The final couple are F2 Fighters from 1987 – ‘Ernst Stoutheart’ and ‘Altdorf Sergeant’. Both these miniatures are from a time when the WFRP and WFB backgrounds were finally starting to mesh together in an uneasy union. Although the RPG game was a fully fleshed out ‘realistic’ world of socio-economic political intrigue, the wargame of fantasy battles struggled to find mechanisms to cope with the vast injection of fluff from the roleplay game. So 3rd Ed WFB always felt stuck in the vein of classic fantasy, heavy with the presence of Orcs, Elves and Dwarfs rather than the grim dark Human centric Renaissance Period feel of WFRP. For this reason the two games sat uneasily side by side in my view despite their supposedly shared background. Even the later Realms of Chaos books put the WFB action at the furthest points of Human influence – the chaos wastes or in the deepest of Empirical forest rather than the backstreets of Altdorf like WFRP had. By the time WFRP was finally sidelined in 1992 GW had already taken the opportunity to pluck the easily workable bits from it to use with the forthcoming 4th Ed WFB (Bretonnian Knights for instance) whilst other concepts were slowly spoon fed back into the game as new additions (such as Tilean Mercenary units). 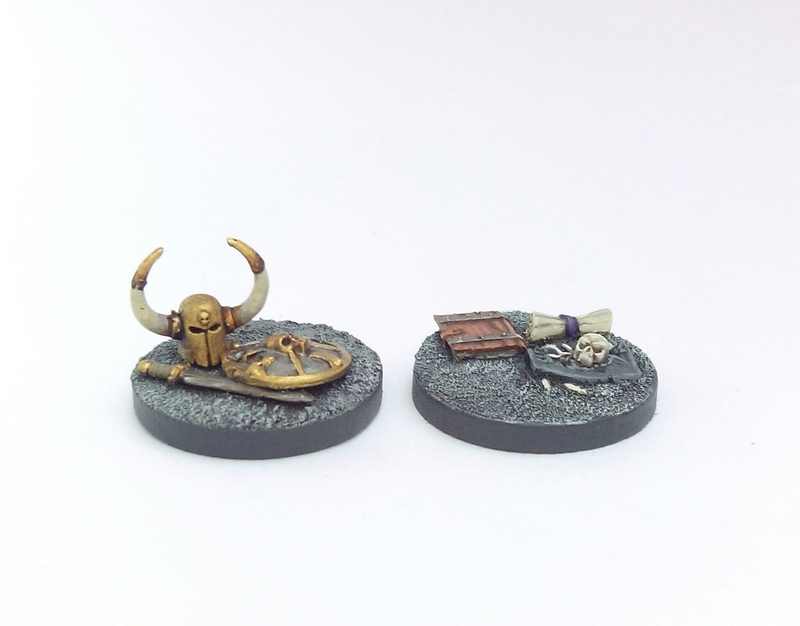 Anyway, both of these miniatures painted up okay and will work quite well as murder hobos in Frostgrave. This entry was posted in Post-1990 and tagged Citadel, Frostgrave, Games Workshop, Warhammer on November 15, 2015 by Hobgoblin Orange.